Come June, the upper school campus will be filled with students in grades 6-12 who are participating in Harker’s Summer Institute (SI), a unique program open to both Harker students and those from other schools. The Summer Institute has two tracks, one designed for middle schoolers and another for high school students. Participants typically combine a morning academic program with afternoon activities, allowing them to earn credits and learn new skills, yet still enjoy summertime fun. The academic portion of the day offers rigorous for-credit courses such as algebra, economics and programming, as well as non-credit opportunities for enrichment and growth including creative writing, Web design, debate and robotics. A driver’s education course is available for students ages 15 and up. 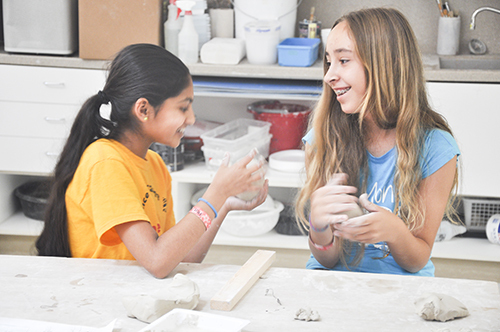 For middle schoolers (grades 6-8), SI’s afternoon activity program includes many specialty classes and recreational activities; students in grade 9 are also invited to sign up for the afternoon activities. Last year’s participants were introduced to specialty classes including backyard games, volleyball boot camp and cooking. These classes will be available again this year, along with other rotating options such as art, jewelry making, magic, improv, dance, tech, junior lifeguard, chess and circus arts. There also will be off-campus field trips every couple of weeks to various sites such as The Tech Museum and Capitola. Keith Hirota will reprise his role as SI middle school director and Evan Barth, upper school dean of studies, has enthusiastically taken on the role of SI principal for the upper school students. Barth – who joined Harker in fall 2000 and has taught mathematics, coached soccer and volleyball, been a class dean and served on the Honor Council – said he is looking forward to working with SI’s older students this summer. In his present capacity as the dean of studies, he meets with each incoming student to create an academic plan for high school. Hirota noted the success of last year’s program, which totaled some 920 middle and upper school students. An average of 80-85 students per week attended the afternoon activities. Both Hirota and Barth agreed that the variety of choices and flexibility of the SI program allows students to design their own perfect schedule, taking into consideration individual academic needs and personal interests.